Avoid contacting with high temperatures and acid, alkali solution. Keep your jewelry away from water,better not wear when swimming, showering or hot spring. Perfume, alcohol and some other chemical liquid may damage your jewelry. For keeping them shining and sparkling longer, put your jewelry in the box or velvet bag when not wearing. One Order including two pairs Ear Plugs Flesh Tunnels. one is Rose Quartz Natual Stone, Another one is Sofe Silicone Flesh Color Retainer Ear Gauges Plugs. to fit for you diferent styles. 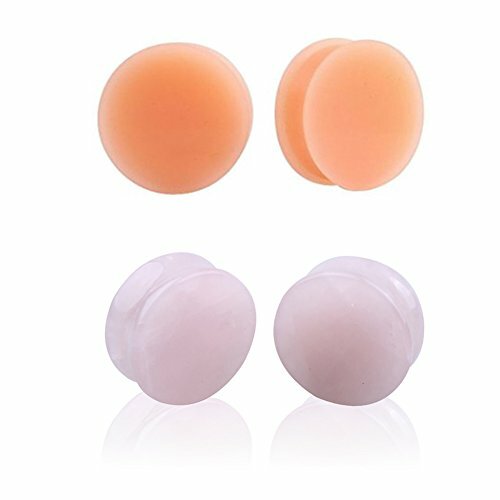 MATERIAL - Natual Stone & Sofe Silicone; BODY JEWELRY Style :Plug. Flexible and comfortable to wear.Gauge: 4g(5mm),2g(6mm),0g(8mm),00g(10mm),1/2"(12mm),9/16"(14mm),5/8"(16mm),11/16"(18mm). You can choose perfect Size for yourself. Packed in Gift Velet Pouch,A Wonderful gift for you and your friends.These are perfect for daily wearing, party. You will create your own unique ear piercings and show your personality. We promise to give you the best shopping experience and if you have any questions before or after the purchase,please feel free to contact us. If you have any questions about this product by HQLA, contact us by completing and submitting the form below. If you are looking for a specif part number, please include it with your message.